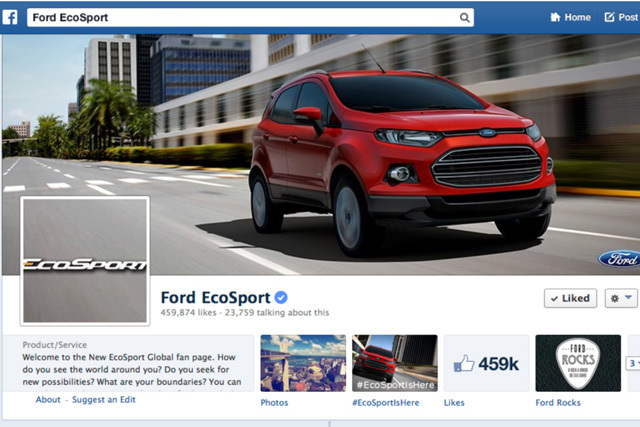 Ford wanted a digital and innovative way to promote its new Limited Edition EcoSport, and so decided to launch it exclusively on Facebook. The objective was to raise awareness and create buzz around the launch and to drive sales of 500 limited-edition cars across 11 key markets. 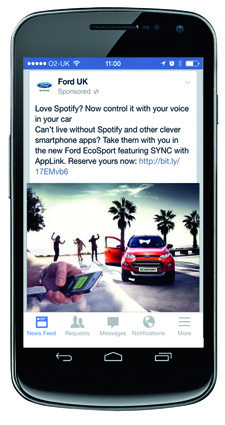 Ford placed page post photo ads in its target audiences’ News Feeds on both desktop and mobile to increase brand awareness. The brand chose to connect with its audience in the News Feed because this is where people on Facebook spend the majority of their time. Ads contained compelling images of the car’s most striking features to entice prospective customers to check out the new model. All content was created in close partnership with Blue Hive (the joint venture between Wunderman, Ogilvy and Mindshare) and Facebook. The team identified the features of the car that would resonate most strongly with consumers and then chose formats and placements that would deliver the creative most effectively. This meant that Ford could build a central bank of creative assets, which the local-market Mindshare teams were then able to use and rotate to deliver the best performance against their audiences. The ads linked through to a unique landing page for the new Ford EcoSport where people could discover more about the car and configure their own model based on a range of three launch colours. Consumers could then claim a voucher with details of their configuration and had seven days to take it to their local dealer and complete the purchase. There was no price incentive; Ford simply used Facebook’s advertising and targeting tools to reach the right people, and deliver a high volume of in-market shoppers to the conversion page, directly from their Facebook News Feeds. Ford made a bold decision to promote the EcoSport exclusively via Facebook – but it clearly paid off. By the end of the campaign, all 500 Limited Edition EcoSport models had been sold at local dealers across all 11 markets. Selling all the limited-edition models was a fantastic result, particularly given that they were not promoted through any other channels. People heard about the model on Facebook, engaged with the ads to claim the vouchers and then went into a dealership and purchased the car. "Ford’s products are known for their innovative features and design, so it was only right that it sought an innovative and unique way in which to sell the first 500 EcoSport models across Europe. 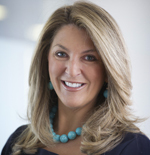 "Generating this level of mass awareness, while cutting through to reach in-market shoppers, is a challenge for all automotive brands, so for Ford to be bold and produce such stellar results is very exciting. "There are still many unknowns in the usual automotive purchase cycle, and attribution among the channel mix is notoriously hard to quantify, so for Ford to place its bet on one media channel to drive direct sales was a very bold move that paid off handsomely." "This campaign was brave and risky but it paid off. Not that many brands have proved a Facebook campaign can deliver physical results such as footfall or in-store sales. "This campaign used Facebook’s international scale yet utilised the tools the platform offers for granular targeting and creating response. "Faced with a difficult brief of delivering sales of a limited-edition car in multiple territories, Ford and Mindshare made a bold move to commit their entire media budget to Facebook. By using the platform creatively, they accessed niche audiences and created demand by using the best formats, delivering real-world results with all 500 models sold despite no other media support." "Ford’s choices for this campaign were canny. Yes, we car-buyers want lists of numbers for MPGs and boot capacities to satisfy our rational side. But mainly we want to gaze at gorgeous pics of streamlined bodies (ahem) and imagine ourselves zipping down country lanes. Hence Ford’s decision to focus on exterior images of the new EcoSport and allow potential buyers to virtually build their own vehicles. 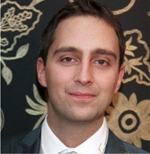 "This enhanced their dreaming processes and moved them seamlessly along towards the crucial purchase decision. It also capitalised on the fact that people accessing Facebook via mobile will be immediately drawn to images."